We've seen it in third-party speakers and cars already at this week's Consumer Electronics Show in Las Vegas, but Amazon's Alexa is also about to become a smartphone personal assistant. Chinese mobile company Huawei used CES 2017 to announce it will be the first handset maker in the U.S. to pre-load the voice-activated AI into a phone. 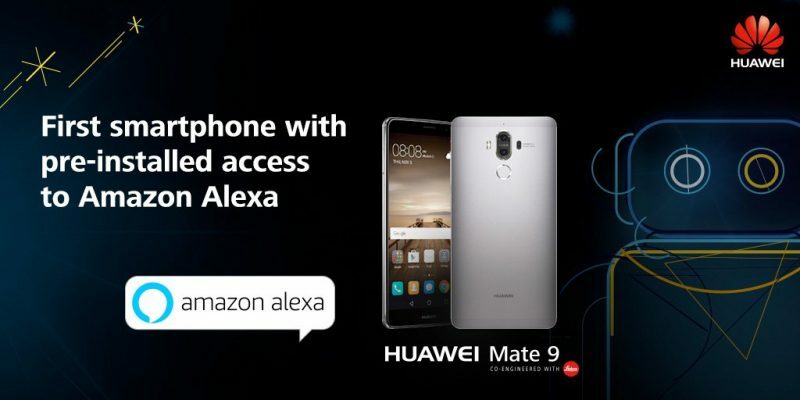 Less than a week ago, Alexa was exclusive to Amazon's tablets and Echo smart speakers, but anyone who picks up the U.S. version of Huawei's flagship Mate 9 smartphone – set to launch "early 2017" – will also be able to invoke the virtual assistant. Huawei's announcement sets the stage for Alexa to compete directly in a mobile market already busy with AI assistants battling it out for supremacy. Meanwhile, Apple's Siri is still only available on iOS devices and Macs running macOS Sierra, although rumors have persisted that Cupertino is working on its own Siri-powered connected smart speaker, while the AI is likely to feature heavily in any autonomous car system the company may be working on. Elsewhere, Google recently upgraded its Google Assistant for its own-branded Pixel phones, and last year Samsung acquired Viv – developed by the creators of Siri – for integration in its next round of flagship smartphones. Is apple asleep at the wheel here? When is Siri 2.0 happening Tim? Siri just loves finding things on the web for whatever thing she doesn't understand. "I found this on the web for why is Siri so dumb?" Is this a paid deal or is Amazon giving it away for free hoping that it only drives more people to other Amazon services? It is free. Here (http://phx.corporate-ir.net/phoenix.zhtml?c=176060&p=irol-newsArticle&ID=2062557) is the press release. Surprised someone in such need of a assistant to do things for them has the free time to read and comment on a website. I miss the days when people used their phones themselves and didn't pretend they were too busy to the point they needed a virtual assistant to use their phone for them. I'd still rather not talk to an AI living inside my phone. So I can't really say Siri is missing anything here for me personally, if I wouldn't have used this either.